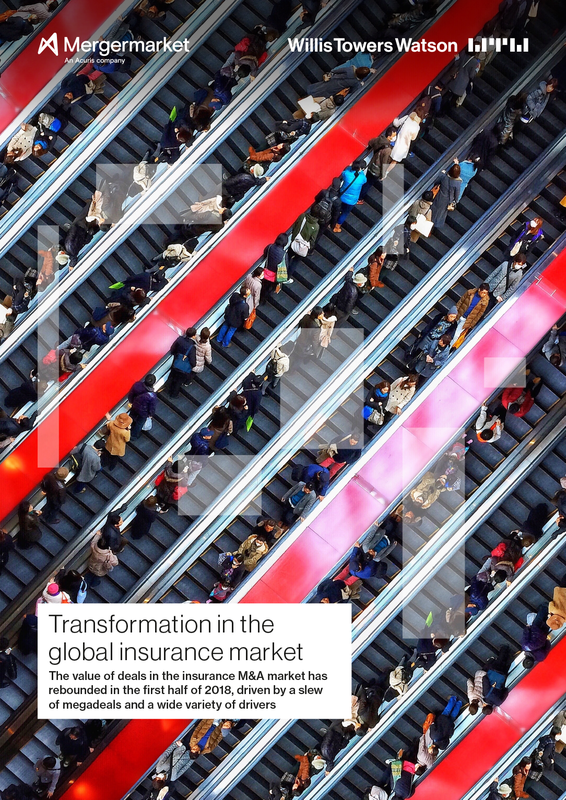 Mergermarket is pleased to present Transformation in the global insurance market, published in association with Willis Towers Watson. This report examines the key factors driving global insurance M&A in 2018, as well as the challenges facing dealmakers. Deal value for global insurance was up €37bn in H1 2018, with 14 deals worth over €500m driving value to its highest first-half total since the financial crisis. There was a downturn in deal volume this year, with just 84 deals announced in total for the first half of the year. As companies divested unwanted parts of their business in order to return to a core strategy approach, valuable assets have been appearing on the market and driving acquisitions from private equity investors. The insurance sector has been slow to engage with new technology in comparison to others, and it will become more important for dealmakers to engage with insurtech in the future if they are not to fall behind the digital curve.